Monsieur Douady the mason came round yesterday morning to discuss the wood fire we were thinking of buying and how we want it fitted. He will rebuild our chimney, fit the flue, and install a salvaged fireplace surround. As is customary in France, he will not connect up the stove itself though. That is a job for the plumber. We have opted to buy our own poêle (wood burning slow combustion stove) and we went off to do that yesterday after checking with Monsieur Douady that the one we favoured was suitable and would fit in the fireplace. I have spent a long time - days and weeks of research - trying to decide which stove was right for us. 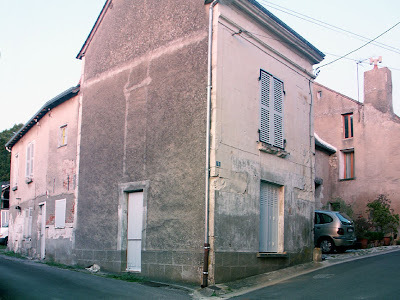 There are many temptingly cheap poêles easily available, but after discussion with others who have installed slow combustion wood stoves, we realised that there was a reason they were so cheap. They just aren't as good quality, made of steel plate rather than cast iron, often single skinned with poor door seals and annoyingly small fireboxes . The Invicta Carolo model we have bought is made in France of cast iron, takes 50cm logs and will burn 2 logs for 10 hours unattended overnight. It comes with a 5 year guarantee and we can choose to have the flue exit from the top or the back. We are going to have the flue come from the top so the stove sits almost flush with the front of the fireplace surround, and we are going to have a 30cm gap between the top of the stove and the mantelpiece, so we can put a saucepan or kettle on the stove if we want to. Best of all it was on offer at half price and only €399. We purchased the stove at Bricomarché. To our amazement, the store actually had one in stock (it's pretty standard for French stores to advertise a good special, but have so few of the item in stock that if you are not there beating down the door on the first day of the offer you will miss out). Susan filled out the paperwork for the guarantee and paid, then we drove round the back of the store for the stove to be loaded into the car. 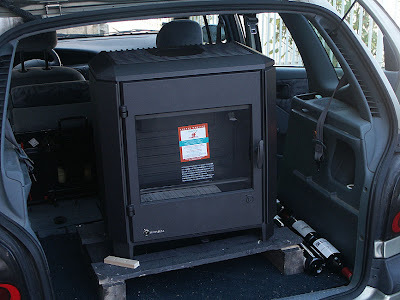 The stove was on a pallet and they used a forklift to get it into the car as it weighs 118kg. When we got it home, John came down to help unload it. There was much discussion about how to get it over the rim of the car boot. After about an hour of theorising about how to slide it down a ladder (reminiscent of the bath episode) and what size lumps of wood we would need to jack it up, we decided to see if we could lighten it by removing some pieces such as the door and the fire grate. At this point Pierre-Yves arrived home from work and was able to provide extra muscle. Once we had three people lifting a considerably lightened stove the job was an easy one. Easy, of course, being a relative term! Now we await M.Douady's arrival to measure the flue so he can make sure he buys the right diameter tubage and then his return to do the chimney. Next move for me is buying wood - and a chainsaw. Vroom vroom!! For the past couple of weeks the swallows have been preparing to leave for Africa. First it was the young birds all lined up on the telephone wires and on the ledges of the house opposite ours, then it was the adult birds. There are some thing that just cannot live up to the inner 15 year old's expectations, and this is one of them. 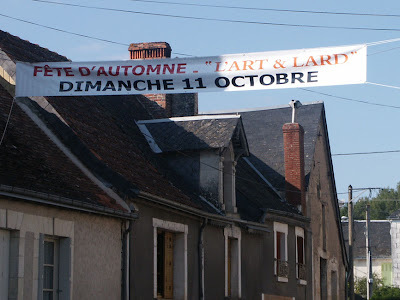 I will be visiting the fête in anticipation of seeing at least one copy of Michelangelo's David made out of pig fat, but I feel I may be disappointed. I've been away in Stratford-upon-Avon at a conference. 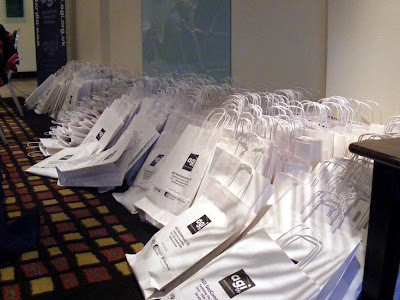 Conference bags ready to be handed out. The conference went extremely well. Everyone agreed the food was particularly good this year. Lamb shank in a red wine sauce. 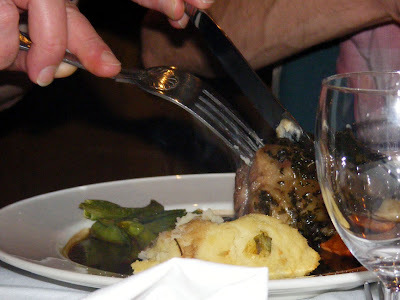 The lamb was delicious, although there was a perfectly horrid mint sauce to go with it, which I am sure had been made with the contents of a box of mint teabags. I didn't get any free time in Stratford, so there are no photos of charming timberframed black and white buildings. 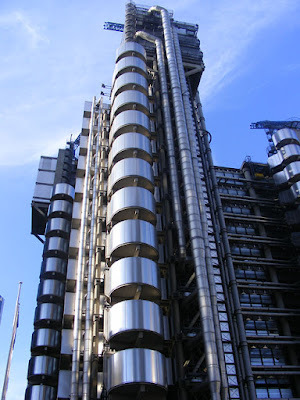 I did get a couple of hours in London, so there are some photos of office blocks. The Angel Inn is in St Giles High Street London, very close to Charing Cross Road and Denmark Street. This is a perfect location for us, as Denmark Street is where you buy guitars and Charing Cross Road is where you buy books, thus covering two of our interest quite nicely. Its location is a real bonus, because like many a London pub and/or restaurant that is half a block away from a main shopping street, the tourists stay away in hordes. (The same thing happens either side of Oxford Street.) We were introduced to this pub by a friend of mine one evening a couple of years ago on our way to a John Hammond concert. 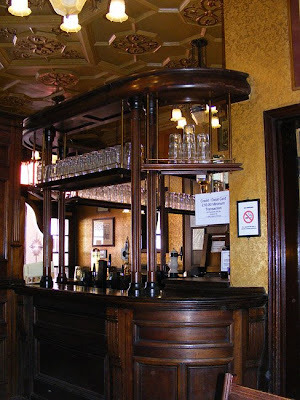 Inside and out, this is a traditional London pub, unreconstrected, ungentrified, and unadorned. 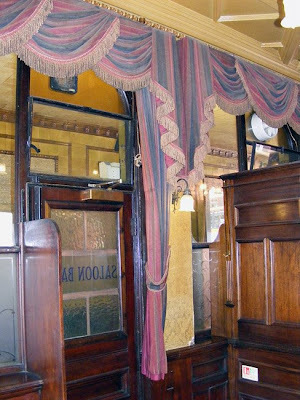 It looks like it hasn't changed in 100 years, and unlike most pubs that give that impression there is no artifice involved. 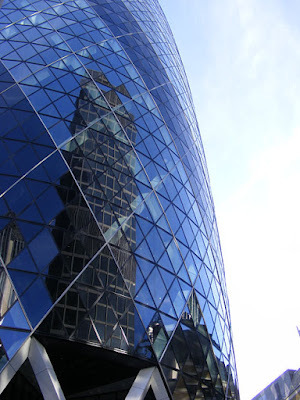 I went there in the beginning of May with Kippa, and again with Susan on our last weekday in London when we had to visit our bank and sort out that sort of stuff. The food is good value, especially considering the sort of prices you can pay in London - main courses about £6 including steak and kidney, fish pie, some Indian dishes. The beer is good, too - Samuel Smith's on tap; a good strong Yorkshire brew, the bitter is particularly recommended if you have an educated palate. 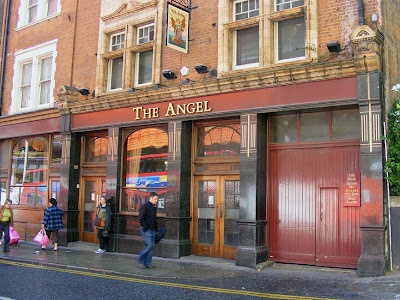 So - if ever you're in London and in need of sustinance, or even just some rehydration, try the Angel. Get it while it lasts, because I fear this pub is one of a disappearing breed. A slow day in Preuilly - Bengt and Suzanne popped in to say hi, and apart from that nothing much happened much except for some painting. It will be nice when the external walls have been repaired and rendered, but I am guessing that wont be for another 12 months or so. I am pleased with the shutter colour though. I am learning all the time! I mentioned yesterday that Célestine and I were having some issues. I decided to have a shot at sorting them out, so after a cup of coffee I fitted up my work lights in the garage, and started having a think whilst jiggling things on the motor (sometimes it works). My first issue was why there was no fuel being pulled into the new filter I had fitted, so I got bold, removed the line out from the filter and started sucking. I managed to get fuel coming into the filter without getting any in my mouth (a miracle), then refitted the hose. I then tried starting the car - no luck. 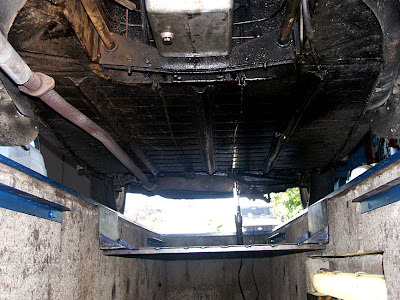 At that stage I emailed the garage in Descartes who fitted the alternator. Twenty minutes later I received a reply about priming the pump, and also saying that if I emailed back, he would come out to Preuilly. My next step was to remove the air filter and splash some fuel directly into the carburettor. HOORAY!! Car started, but then stopped. I was amazed at this because I had been trying to 24 hours to start the car, and the battery still wasn't dead. 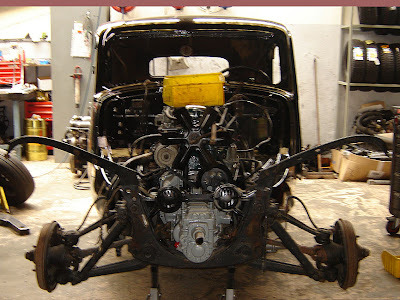 I kept splashing fuel into the carburettor in the hope that the pump would force some fuel in and all would be well. It wasn't. I mailed this information back to the garage, and after lunch M. Musseau arrived. He did all sorts of stuff, including cleaning and rebuilding the carburettor, cleaning out hoses and testing the pump. 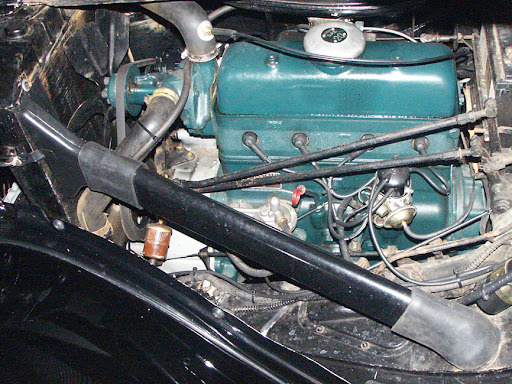 He got the car working, but only by putting a fuel line into a jerrycan - the fuel tank was seized solid. And that is how I drove it to Descartes: jerrycan strapped to the front passenger's seat, with the fuel pipe sneaking across my legs, and through the heater vent to the fuel pump. It was a nice day for a drive though - even if I did have an open jerrycan sitting next to me while I was doing it. I found that I was grinning like the Cheshire Cat even in those conditions. I also learnt that if you leave the ignition on for a long time the ignition coil overheats, and the car won't start - and that the old coil in the boot still works. When we got to descartes the car went straight over the inspection pit. We checked out the noisy exhaust as well as the fuel tank fittings. M. Musseau will be removing the tank, cleaning it, and treating the inside with a "product" (not sure if it's an epoxy or something more modern). He will also weld a crack in the exhaust pipe. I like M. Musseau's attitude: he likes the car, therefore I am allowed into the workshop and into the inspection pit, and even if I don't fully comprehend, he tells me stuff. I have to say a huge thank you to John, who followed me to Descartes and bought me home again. 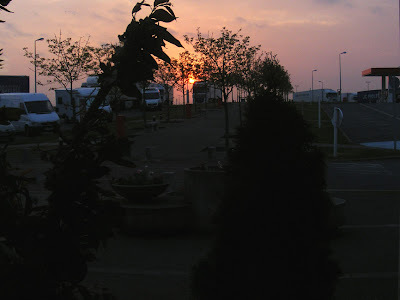 For the past couple of years, most of the time I have spent in Preuilly I have been on my own. Susan was working in London and I was working on the house. Then we moved here permanently, and since then it has been Susan and I all the time. Well - this week she is back in the UK working (at Stratford upon Avon) and I am at home. I have been busy, too - I dropped Susan off at Tours airport on Monday afternoon, and since then I feel like I havent stopped. I have made huge amounts of pasta sauce to freeze and a batch of peach jam. I also tried (unsucessfully) to dry some tomatoes. Ever since Susan washed the numbers off the temperature knob of the oven it has been difficult to know what heat you are using. Whatever heat I was using was too much. In addition I found time to go down to the potager and pick up a couple of wheelbarrow loads of windfalls and put them on the compost heap. 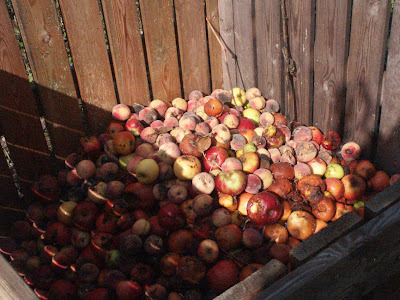 It's a bit sad - a compost heap of apples and peaches. 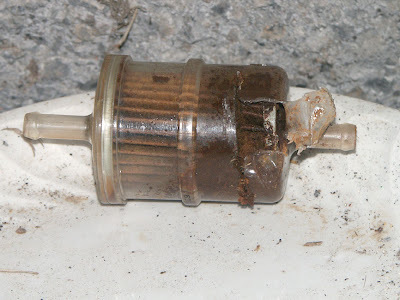 I also took the opportunity to change the fuel filter on Célestine. This was not as straightforward as I hoped, and at the moment I can't get her started (again). The fuel pump is mechanical and only works when the engine is running, and because I have broken the vacuum in the fuel line I can't get the fuel flowing again. This is peeving, but hopefully it will be a quick fix when I work out what to do. I will be changing the fuel filter fairly often, as the fuel tank has a rust issue I hope will sort itself out after a couple of changes. Alex came over and mowed the potager yesterday afternoon. This really needed doing a couple of weeks ago, but we were waiting until after the rain. Then we were waiting until the sun came again, and luckily today we had a lovely afternoon. While Alex mowed I picked courgettes, tomatoes, peaches, apples, chillies and grapes. start the day turned really nice. Hopefully that will be the last mow of the year. 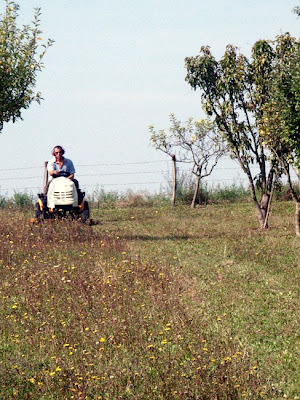 Next job in the orchard is to prune the cherry trees and pick grapes. Last weekend I managed to visit the Potern museum for the first time. Simon visited exactly a year ago and wrote about it here. 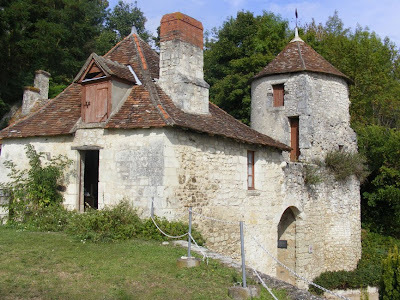 The Poterne was the gatehouse to the château in Preuilly-sur-Claise. 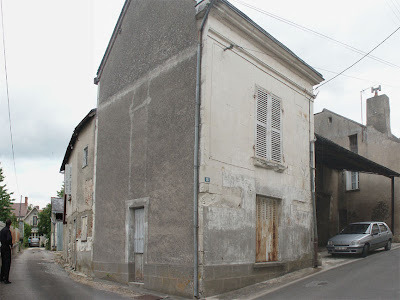 It is now the town museum, run by the Société Archaéologique (local history society). At the moment it is funded by the Society, but that responsibility is apparently due to be transferred to the Commune soon. The Société Archaéologique has done a marvellous job of displaying and preserving a multitude of objects from Preuilly's past. 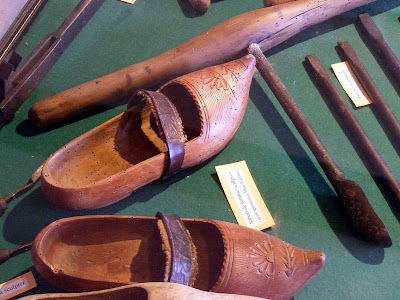 There is a large collection of flint tools from the prehistoric, carved capitals from the middle ages, clog makers tools, apprentice and journeyman pieces from earlier generations of wood carvers and metal workers and assorted domestic objects. The pride of the collection are the Touraine bonnets, with their delicate hand stitched needlelace and incredibly finely goffered (steam pleated over metal rods) lace brims. The museum is staffed entirely by volunteers, many of them teenagers, who open up and give guided tours (in French - if you speak English there is a written guide). *everyone and his dog world has taken a photo of the poterne from below - except Simon. Otherwise we could show you the "usual" view as well. On Saturday night we attended the mediaeval feast put on by the local history society to coincide with the Journées du Patrimoine. The entertainment was provided by a re-enactment troupe of musicians and singers who acquitted themselves rather well. 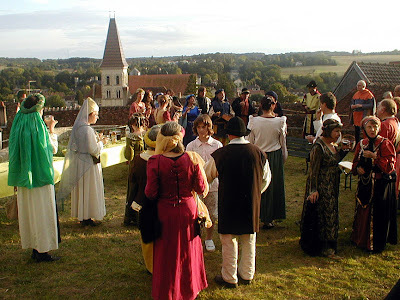 The evening started by gathering at the front of the abbey, then moving on to the terrace of the Poterne (château gatehouse and now museum). Apparently the dinner itself was held on the terrace last year, but it was freezing, so it was moved indoors this year. 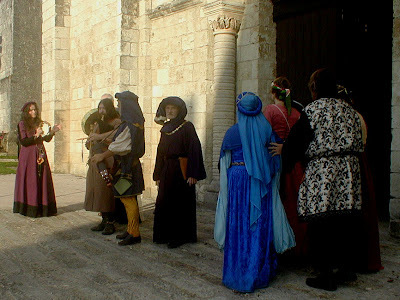 We were introduced to a number of people, including several connected to the Communauté des Communes. This is a voluntary intermediary level of public administration which is funded by the businesses of the area and whose focus is to improve the physical and economic environment of the member communes. I made slightly more of an impression than is strictly necessary on the man responsible for tourism in the area by hitting my head on a low beam and bouncing backwards into his arms. He was perfectly charming about it and made sure to check on my well-being several times during the evening. I was really impressed by how many grown men were prepared to dress up in tights and dresses and walk around town. They were clearly having a great time, and it wasn't the alcohol fueling the bonhomie, although we all had a glass or two of spiced red wine at the Poterne. From there we progressed to the function room at l'Image, which Simon and I have never been in before. It's a long room, with nicely restored pierre apparente walls decorated with traditional hunting trophies (deer skulls, legs bent to form hooks for garlands, hooves with the leg hide braided). 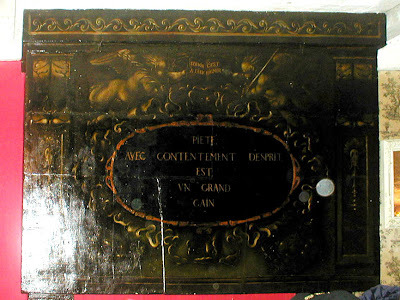 There is also a large fireplace, decorated with a Protestant text from the aftermath of the Wars of Religion, when Preuilly's richest citizen and a significant number of local families were either imprisoned, forced to abjure their faith or go 'underground'. Chef Jean-Michel Chedozeau created a special menu for the night (I suspect he really enjoys this sort of event, where he can do something a bit different). First course was a pork and vegetable terrine flavoured with nutmeg, dressed with saffron flavoured swede and accompanied by stewed potimarron (a type of small pumpkin, very popular in France), flavoured with ginger and topped with pickled cherries. The pumpkin cherry combo was absolutely delicious. Following this was sturgeon in a rich sauce seasoned with juniper and cloves (very tasty), served with cumin spiced green lentils and leeks wrapped in bacon. Both the lentils and leeks were left by many people, who said the lentils were too spicy and that the portion was too big. We thought the leeks were delicious, and were interested by the 'too spicy' comment about the lentils. As far as we were concerned, the lentils were much as I would normally cook them (I'm a big fan of cumin). In fact, the sauce on the fish was spicier, and far more dominant than the touch of cumin in the lentils, but the fish got a very positive review from everyone. Then there was fromage frais with herbs, served with a perfectly ripe half fig. 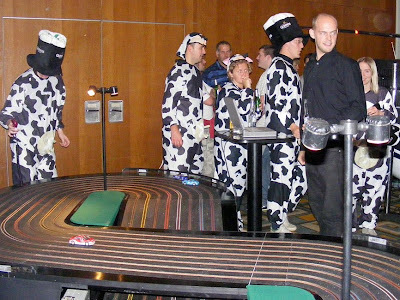 Once again, many people felt the herbs in the cheese (the chives, in particular) were too strong. The woman opposite me said that she really only liked fromage frais nature (plain). I'm sure Jean-Michel had done his homework and was presenting as good a representation of the mediaeval diet as he could, but modern Tourangelle food, whilst it is often robust and hearty, is also quite delicately flavoured and many people do not like more than a hint of herbs and spices. I think everyone loved the dessert though. It was a glass cup with stewed apple on one side and stewed rhubarb on the other, topped with chestnut cream, a slice of pain d'épice and dried fruits. Scrumptious. Simon and I were seated between two men both called Jean-Paul, opposite a woman called Jeanne and our friend John. To facilitate conversation the Jean-Paul to my right said that he would be Jean-Paul Un and so the man to Simon's left became Jean-Paul Deux. John was dubbed Jean Simple. Jeanne said that her husband's name was also Jean-Paul, but because it was such a common name, he never used it, and was just Jean. Simon drank enough to attempt complicated French with Jean-Paul Deux, who reads the blog and wanted to know all about Célestine. I was mindful that I had hit my head hard enough to possibly be concussed, so didn't drink anything but water. Jeanne and her friend Mme Blaszyk (seated opposite Jean-Paul Un) are members of the choral group that was providing the entertainment, and although not part of the troupe working that night, sang along for their own pleasure, including taking parts in the rounds and harmonies, which was lovely. Jean-Paul Un plonked a great big cast iron key on the table and explained that it was his front door key. I expect he didn't want it wearing a hole in his coat pocket - it was at least 15cm long with a shaft thicker than a pencil. There was the inevitable round of jokes about chastity belts and someone asked if it was the key to paradise. A lot of people (particularly Bernard de la Motte and Marc Dimanche) worked very hard at making this event the enjoyable occasion it was. We look forward to attending and being more involved next year. This weekend is Journées européennes du patrimoine, two days of heritage events in all 49 states that are signatories to the Cultural Convention of the European Union. 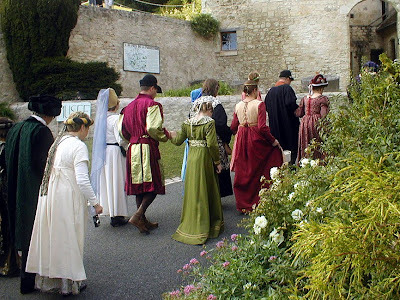 In the UK it is most noticable in the Open House events, but in Preuilly last night it was most noticeable in the group of people in Mediaeval costume parading the streets. If you're anywhere in the zone today get out there and check out the local heritage. You don't have to travel far, but you might find yourself amazed at what there is to see. Our neighbours often check which of our trees or vegetables are 'giving' (donner), meaning which we are picking or harvesting. 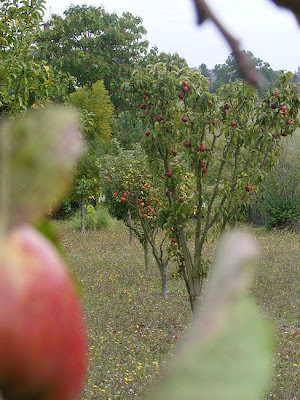 The last few days we've had some very welcome steady rain, and yesterday afternoon there was a long sunny spell, so we nipped down to the orchard to see how everything was responding to suddenly receiving adequate water after months of dry. 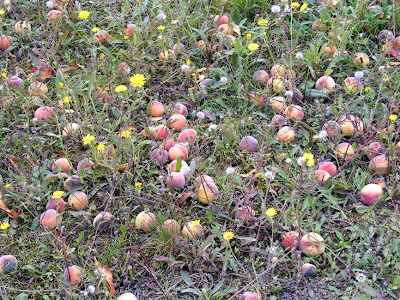 It's too late for the big nectarine by the potager gate, which had huge numbers of fruit, only to drop almost all eventually. The few we picked were small and dry, with tough bitter skins. The peaches have fared a little better. They've been small, but cook reasonably well. The rain has had an almost instantaneous effect on them. 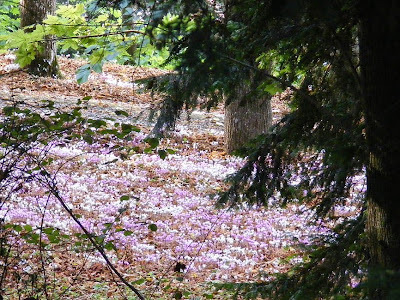 Suddenly, they have doubled in size, but the shock has been too much and they have all dropped off the trees. Fortunately, they are perfectly usable and I have been blanching, peeling, stoning and roasting or stewing them as fast as I can so they can go in the freezer. Next to 'give' will be the apples. They are starting to be significantly targeted by birds, so I am planning to strip at least one of the trees today. Then the table grapes will come in. They are still a little sour, but edible. We don't know what we are going to do with all those grapes though. Sadly, the white table grapes have succumbed to a fungal disease, so it's just the dark ones. Susan went to the market in the rain, while I sat at home nursing my cold. We have had the heater on in the front room, which is quite cozy and comfortable, but we are looking forwards to the day when we have a proper fire in the room. We rang M. Douady to see if we can get a firm date for the work, but only got as far as his answering machine. (I say we, in this case that means Susan). 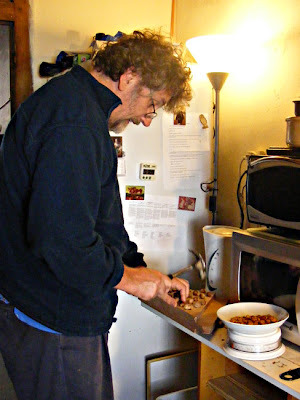 In the afternoon Susan spent most of her time sorting out produce; peeling and stewing Peaches, making apple things, and I chipped in with cracking another couple of hundred hazelnuts. It rained most of yesterday, which is good. We need a couple of days of rain, then a couple of days of sunny weather. If that happens, then the winemakers will be happy, and that means we are all happy. But not only the winemakers: a couple of days of rain followed by sun should help our peaches no end, and add the finishing touches to the rest of our tomatoes, aubergine, chillies and peppers. It won't do our melons or courgettes any harm either, and we may even get a last burst of beans. We spent most of the day just flopping around the house, because we had a big day on Tuesday what with one thing and another, and like most of the world we have our pre-winter snuffles happening. It's a pity we don't have our chimney and fireplace installed yet, because it would be a perfect day to nestle in front of a nice fire with a cup of hot chocolate and a good book. The speaking French bit is a worry for me, but Susan continually amazes with the way she handles stuff. I listen and understand more than I can communicate back to people, which is frustrating. I use a lot of hand gestures and pointing where Susan uses words (and grammar! ), and I must admit I am not good at answering the phone. I will answer but then hand it on to Susan because all I hear is noises, not words, and even if I have understood I often don't have the vocabulary to respond appropriately. This makes me a nightmare for telemarketers, but that is their problem, not mine. I do try to speak French at the appropriate time, and will try my best, especially at garages and hardware stores, even though I don't do those places terribly well in English either. We hope Célestine will help us improved my language skills, because people want to talk about her when they see us out and about. 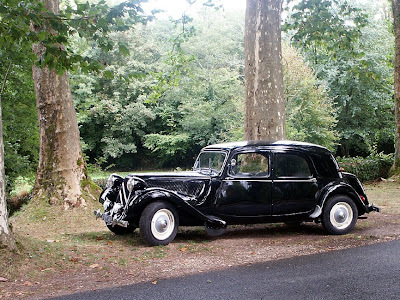 Luckily the other car is the most common and anonymous car in the whole of France, so if we're having a non French day, we can hide. Celestine came back from the garage on Monday evening with a new alternator in place of her clapped out old dynamo. To celebrate we thought we would take her on a little trip so I could get more used to driving her. We had problems yesterday morning with her not starting, but I think that was a block in the fuel filter, because I wiggled it around and she ran fine for the rest of the day. We hope this means our starting problems are behind us. Next stop is having a look at the exhaust, because we are almost antisocially parpy at the moment. 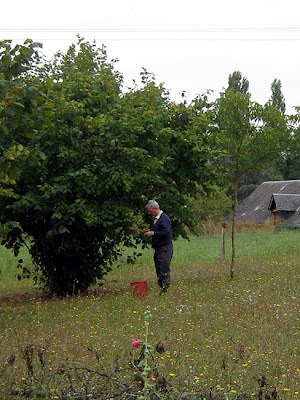 We have a lot of hazelnut trees on our verger - about five, depending on what you define as a tree. Last week the leaves started to go brown on the trees, and this is apparently one of the signs to start harvesting. As we had a spare morning we went down mob handed - Susan, Pat, Geoff and myself, and had a good rummage for nuts. In addition to picking nuts off the tree, we picked them up off the ground; it has been quite windy of late, and a lot of the clusters of nuts had been blown off. In about an hour we picked (and picked up) about 10 litres of hazelnuts. A couple of days later, engaging in some displacement activity, I decided to fashion a mass nut cracking platform out of a sample piece of the staircase wood. It takes two dozen nuts at a time and you hit them with a hammer. Our neighbour's prediction about the nuts being no good seems pessimistic. I cracked over 100 nuts and the proportion with empty shells was about one in ten. The ones with nuts have good sized kernels, and they taste good too, so we are very pleased that our labours look like being rewarded after all. Yes, French people really do use this most stereotyped of French phrases. It has been a little bit Anglicised for use as an expression of delight or childlike wonder, and indeed, French people will use it to indicate they are impressed. However, it is used more often in France to indicate your disquiet at a situation, to express your dismay or even a certain horror. When used this way it is appropriate to accompany the words with a loose, spread-fingered shaking of the hand in a vertical plane. It is important to use an upward inflection on the final la if you wish to convey delight and conversely, a downward when your meaning is one of dismay. And in France it is always oh or ah not 'ooh' at the beginning. What I haven't worked out is if it should be là or la. I think it is oh la la (which, oddly, would be 'oh the the') not oh là là (which would be 'oh there there'). Varnishing the stairs looks like being a herculean task. There's a lot of surface area to two storey's worth of staircase when you take into account all the underside as well. We bought a product ages ago to do them with called Syntilor Vitrifacateur Parquet, in clear satin finish, which is a type of polyurethane. we couldn't manage a single block of time long enough to finish it. we couldn't work out how to keep the dust off the drying varnish. after we got it home, we realised that Syntilor products use a proprietary dilutant / solvent, not good old white spirit. We'd bought the tin of Syntilor at BricoDepot in Dissay, which is far enough away for us to be reluctant to go back just for one item. Nobody more local sold Syntilor. we wanted to test the varnish on some samples of wood that the menuisiers had left us, in case we really didn't like the effect, but because we didn't have the solvent, were worried about ruining our brushes. in the meantime, the staircase was being used and getting dirty. It would have to be cleaned before varnishing. In the end, we opened the tin, poured some out and painted a test piece. The Syntilor turned out to be extremely easy to apply and gave us more or less the look we wanted. One of the reasons the lack of the correct solvent was a problem was because we had assumed we would get a better finish if we diluted the product, but this turned out not to be the case. Even though it clearly didn't need diluting, our 15 litre tin was going to go a lot further than we expected, which was a bonus. We soaked the brush in white spirit for 10 or 15 minutes. The brush cleaned OK, but the Syntilor and the white spirit reacted and caused the plastic container to crack. 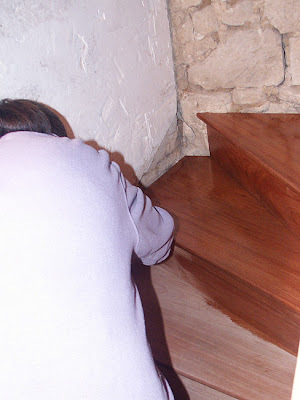 We figured that if we cleaned the brushes out immediately and put the waste liquid in an old metal paint tin it would be OK.
We decided to split the job up, so I cleaned the stairs from the ground floor to the first with the Starwax product I had been so happy with on the wooden floors. Once again, it did an excellent job. After giving it a few hours to dry, I applied the first coat of varnish just to the treads and risers, using a spalter (a very wide thin short bristled brush). The next morning I applied a second coat (no sanding between coats required). It dries quickly enough for falling particles not to be too much of a problem, with is a relief. That's as far as we've got with it, but when we get round to varnishing the banisters, handrail and underneath, we'll give the steps a third coat. It's brought out the colour in the wood so it is rather red, but it goes fine with the tomettes, and I am glad we didn't stain it dark (which would be the traditional French approach). 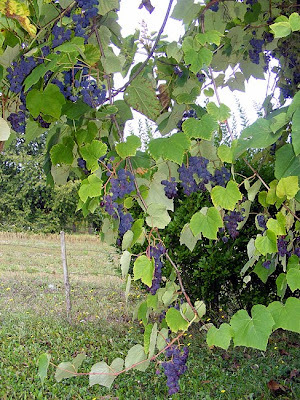 The vendange (wine grape picking) has just started in the Loire Valley, although neither of the winegrowers we visited this week expect to begin their harvest for another 10 days or fortnight. They are hoping the good weather continues, with just one or maybe two days of rain between now and the harvest, to swell the grapes a little more. They are hoping for a small but high quality vintage this year. 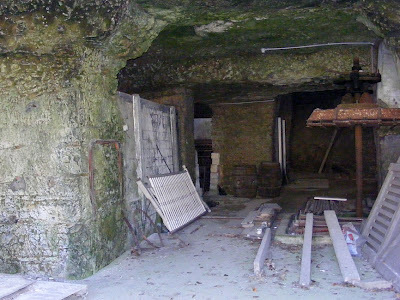 Caves like this are found all over the Touraine. like this one, but many are still in use as wine cellars. On Tuesday we visited Antoine Simoneau's establishment of Domaine Rablais at La Chaise and bought two mixed boxes of wine for a total of €52 - a selection of sauvignon blanc of different ages, a couple of côts and a sweet wine they have called Acacia Blanc because it is aged in Acacia (Robinia) wood barrels. The Acacia Blanc went down very well with some supermarket pâté de canard on baguette for lunch one day, and I'd like to return one day and get some of their older cabernet franc, with its tarry liquorice overtones. 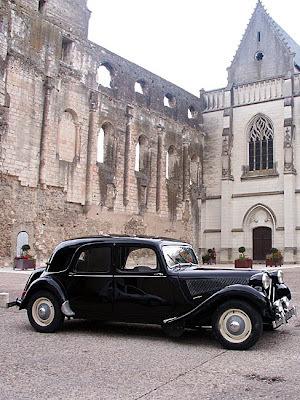 They are very easy to find, as there are quite a few signs in and around Saint-Georges-sur-Cher to their winery, where they have a shop, and the heavily pregnant Carine Simoneau and staff were all very friendly, helpful and speak reasonable English. Madame Simoneau's baby was overdue, so I hope by now the next generation of winegrowers has emerged, and all is well. 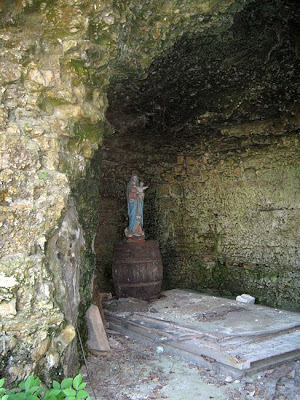 A little shrine set up in a disused cave. A couple of days later we stopped off at Alexandre Monmousseau, of Château Gaudrelle's new cave on the main drag at Rochecorbon, Vouvray, right on the river Loire on the outskirts of Tours. This was to buy some of the sparkling white wine that the area is well-known for. We opted for a pleasant, middle of the road classic style dry wine with smallish bubbles, €7.90 a bottle, on the grounds that most people will like it. The other choice we were offered was a distinctive extremely dry, extremely minerally wine, which I loved, as I have always loved very flinty white wines. In the end we decided it was a bit challenging and that too many people would not like it. Charles, who showed us around the still empty caves, said that they have only been there for two months after having sold the château itself, but not the land and the vines. He was charming, spoke good English and was clearly excited about the new business opportunities the new site offers. It's a great location, and we wish them the very best. We hope to go back and see the new tasting room, cellars and chai (where the wine is actually made) sometime next year. Yesterday we visited Chenonceau and Chaumont sur Loire. We took Geoff and Pat through the chateau and the kitchen gardens at Chenonceau, before going on to the restaurant le Cheval Blanc in Bléré. We had a really pleasant 2 course meal there, the 22€ lunchtime special. The entrée choices were gravlax or rabbit in aspic, and the main course was a choice between duck breast and a duo of fish (zander and bass). been taken a billion times before, so I didn't even try! 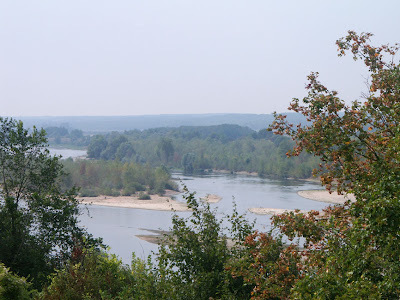 We then drove to Chaumont sur Loire via the viewpoint for Chenonceau that's on the opposite bank and Montrichard. For some reason Montrichard is a Chateau that gets overlooked in the greater scheme of things - maybe because it is a medieval fortress rather than a renaissance playground - but it is a very impressive sight, perched on its cliff above the river Cher. has taken this photo, we hadn't before yesterday. 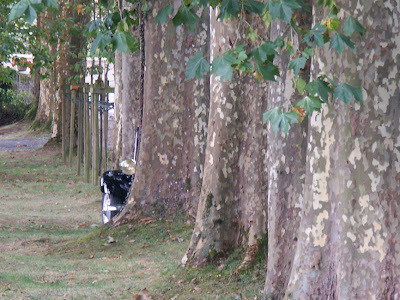 Chaumont is the site of an annual garden festival, which Susan really enjoyed (and will write about later), and seems to be another of the less crowded chateaux. 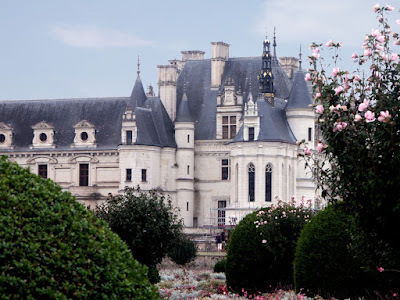 It has splendid views of the Loire (even I was impressed, and usually the Loire River itself doesn't move me) and a large, more "English" parkland garden. We had hoped to take Célestine, but she is still awaiting her new alternator so we had to make do with the Renault. 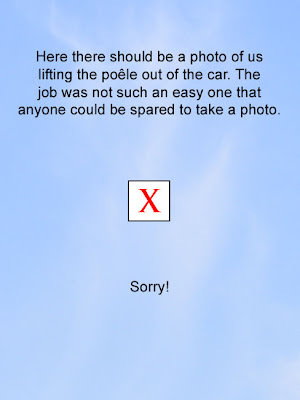 It's a good enough car, but it doesn't make us feel special like Célestine does. 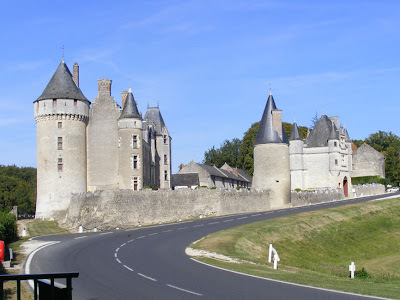 Bright still days in September and February are the very best for photographing châteaux in our experience. The light is clear, the sky is often startlingly blue, and the vegetation is not so lush as to obscure. 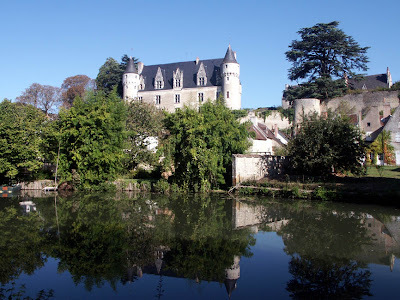 The château at Montrésor appears surprisingly rarely in online photograph albums taken from across the river. 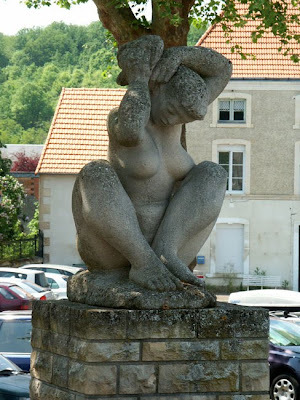 This view is how it is presented by the Tourist Office, but it seems visitors don't always realise that a walk along the balcons (water meadows) is one of the highlights of an outing to Montrésor. Montrésor means 'treasure mountain' and the name comes from a romantic legend which also introduces us to one of the royal symbols of France, the Fire Salamander. According to the legend, a grandson of Clovis was traveling with a young attendant. They stopped to wash at the base of a great rock. To his horror, the Prince suddenly realised he had a 'lizard' clinging to his face! The galant equerry removed the 'lizard' and placed it on the rock, whereupon it disappeared into a small crevice. A short time later it re-emerged and to their amazement it was now a fiery gold colour. Intrigued, they enlarged the gap in the rock and followed the 'lizard' back down a passageway into a vast underground chamber which was full of treasure. 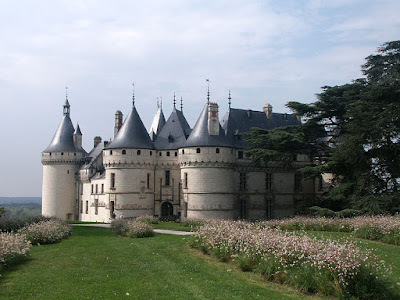 Now fabulously wealthy, the Prince built the castle on the rock and named it Montrésor. He gave a share of the treasure to his young attendant and made him the governor of the castle, enabling him to marry the previously unattainable beautiful princess with whom he was in love. Montpoupon appears as you round a corner on the D764. Many visitors to the Loire Valley discover it by accident and are blown away by the sudden and spectacular view you get. It's well worth doing more than just stopping at the neighbouring Auberge and photographing the château from the bridge (as we have done here). The gatehouse contains a library and chapel; the main building displays furnished rooms with decorative schemes and furniture a melange from the 16th to the 19th centuries; the stables contain a hunting museum with too many trophy heads for modern tastes, but some amusing cartoons which take the mick out of the hunting fraternity; the kitchen is set up as in the late 19th or early 20th century, with one or two rather unusual objects. We are considering taking out an annual subscription, which is extremely good value – allowing us to visit whenever we like for less than the price of two ordinary visits. We found this little juvenile Western Whip Snake Coluber viridis (Couleuvre jaune et verte) in the centre of Preuilly a couple of days ago. It was on the footpath almost opposite the abbey, desperately trying to escape into the garden beyond, and being thwarted again and again by steps, doors and sills. Eventually it made it under the gate. 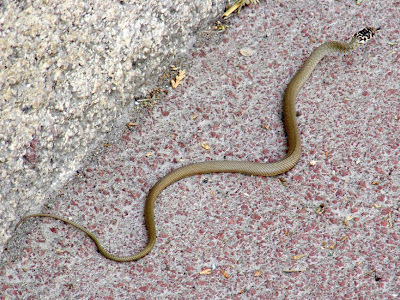 Western Whip Snakes are a type of grass snake and are not venomous. 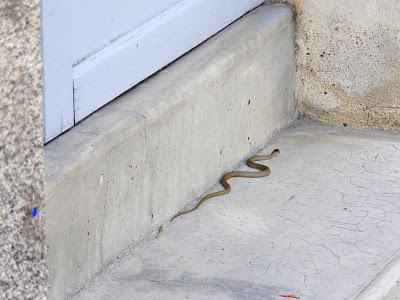 They are by far the most commonly seen snake in central lowland France. This one was perhaps 40-50cm long and no thicker than my finger. Hopefully it will get to grow to be at least 3 times the size. Uncle Geoffrey was excited, because it is the first snake he has ever seen in the wild. We've posted before about snakes here and here. ...or rather on holiday of a sort. Uncle Geoff and Aunty Pat are visiting, so we have taken the opportunity to have the week off and show them around. This means no work on the house, and lots of doing small interesting things. Yesterday that meant I was playing with Célestine to see why she wouldn't start (the dynamo has issues) and have taken her to the garage: Susan cooking a chook, making plum crumble, and stuffing tomatoes: and Pat and Geoff have been revelling in the peace and quiet of Preuilly. 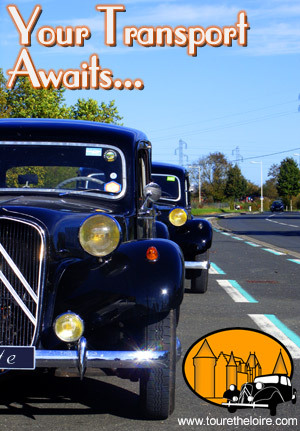 Today we are off to do some sightseeing (in the Renault, unfortunately) and tomorrow we phone the garage to see what the prognosis is. We have an awful lot to talk about! 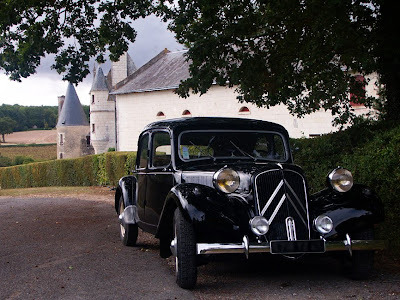 The whole Citroën Traction Avant thing started in 1935 with the 7A, the world's first mass produced front wheel drive, all welded monocoque construction car with independent front wheel suspension. 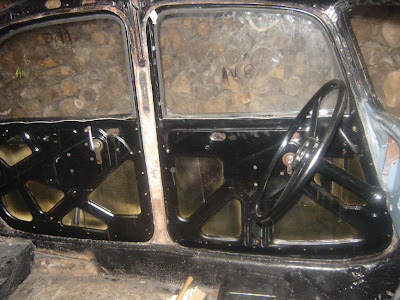 This car was later given a larger engine and became the 11bl, and a larger bodied version was made which became the 11B. If you want more detail here is the place. Celestine was found in a farmyard a number of years ago (some time this century, but we will have to check when exactly). She was in a bit of a state, but was rebuilt from the ground up in 2006. Very generously Monsieur S has given us some photos of the work. One of the reasons for chosing an 11b is the enormous amount of legroom in the back seats. 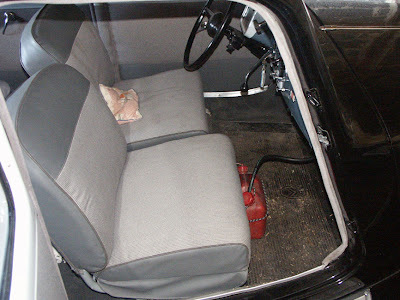 Even with the drivers seat having been moved back for me by 20cm (8 inches) the back legroom can be measured in acres. The other main reason is that you can still get the parts - most parts - just by picking up the phone, and most garagistes can still do the work (and are happy to do so). The fact that it makes us feel like gangsters/spies/movie stars (depending on mood) has nothing to do with it. At all. Driving it is interesting - people wave and flash their headlights, and pedestrians turn and look. This is unusually (and somewhat unfortunately) a cue for me to crunch the gearbox changing from first to second. No synchro, you see, and it takes getting used to. I mentioned on Friday evening that we had an interesting trip from Nemours. This is down to the way the car starts. First you have to be in neutral. No first gear with foot on the clutch here, definitely neutral. Then you put the key in the lock and turn clockwise. This is "contact". Next the choke (in French starter) is pulled out oh so much, then you pull the démarrer button. This will start the car. Failing to get contact before you pull the démarrer will quickly result in a flat battery - as happened to us on the forecourt of the filling station not 300 metres from the garage where we bought Célestine. 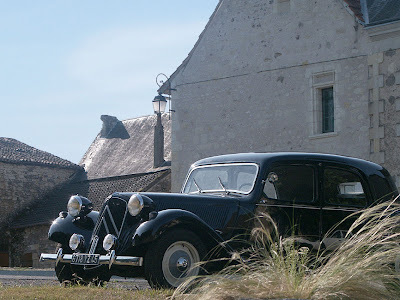 Luckily, a phone call bought Monseuir S out (in a 2cv) to rescue us will one of those battery booster pack things. Not that it was embarrassing in any way, shape or form whatsoever. In future we will have to think back to all those old flying movies, where the pilot calls out "contact" before the prop is swung. We picked up Geoff and Pat at Poitiers airport yesterday, and Célestine made a huge splash - everybody turned and looked, people commented, and we even had a cyclist turning around to take a photo on his phone camera as we followed him down the road. Unfortunately, we were pootling so casually we weren't revving hard enough to recharge the battery, so when we got home the poor old girl was flat out of puff. This means tomorrow we will be buying a charger so we don't embarrass ourselves in future.